Tiffany Foster and Victor. Photos copyright Sportfot. Wellington, FL – March 31, 2016 – Week twelve of the 2016 Winter Equestrian Festival (WEF), sponsored by Rolex, continued on Thursday at the Palm Beach International Equestrian Center (PBIEC) in Wellington, FL, with two featured FEI world ranking classes in the International Ring. Tiffany Foster (CAN) and Victor won the $35,000 Ruby et Violette WEF Challenge Cup Round 12 in the afternoon, and Conor Swail (IRL) and Grafton took top honors in the $35,000 Illustrated Properties 1.45m Jumper Classic in the morning. The 2016 WEF circuit concludes with its twelfth and final week of competition featuring CSI 5* jumper and ‘AA’ rated hunter competition running March 30 – April 3, 2016. Friday features young jumpers in the International Ring with the $10,000 Gut Einhaus Young Jumper Five-Year-Old Final, the $15,000 Adequan® Young Jumper Six-Year-Old Final, and the $20,000 Adequan® Young Jumper Seven-Year-Old Final. Saturday highlights include the $130,000 Suncast® 1.50m Championship Jumper Classic Final Jump-off, presented by SOVARO®, at 6:30 p.m. followed by the $500,000 Rolex Grand Prix CSI 5*. The circuit concludes on Sunday featuring the final round of the $50,000 USHJA International Hunter Derby on the derby field at The Stadium at PBIEC. 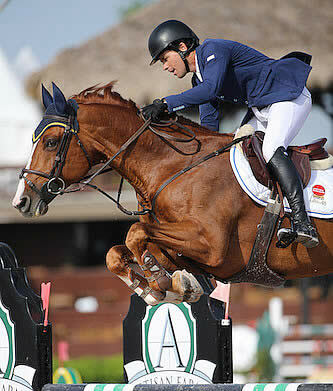 Anthony D’Ambrosio (USA) is the course designer in the International Ring for the final week of WEF competition. He set the track for 38 entries in the final edition of the Ruby et Violette WEF Challenge Cup Series on Thursday. Ten combinations went clear to advance to the jump-off, where eight continued on, and four completed double clear rounds. The win went to Tiffany Foster of Canada aboard Artisan Farms and Torrey Pines Stable’s Victor in a time of 40.22 seconds. Chile’s Samuel Parot and Atlantis finished second in 42.22 seconds. Great Britain’s Ben Maher and Jane Clark’s Sarena clocked the third place time of 45.91 seconds, and USA’s Lauren Hough guided Paris Sellon’s Cornet 39 to fourth place honors in a time of 46.51 seconds. Foster’s longtime partner, Victor, is 14 years old this year. She began riding the Dutch Warmblood gelding (Elmshorn x Grandeur) when he was just eight, and knows her mount very well. In the jump-off, Foster left a big stride out to the last jump, and her experience and trust in Victor paid off. Foster also spoke of the first round and how she had a little good luck in getting to the jump-off as well. Foster hopes that the momentum of her win with Victor on Thursday will carry over, as she plans to jump him again in the $130,000 Suncast® 1.50m Championship Jumper Classic Final on Saturday. She will ride Tripple X III in the $500,000 Rolex Grand Prix CSI 5* to conclude the circuit. In addition to the winning prize money, Foster earned a $3,000 bonus for wearing her SSG ‘Digital’ style riding gloves as part of the SSG Gloves ‘Go Clean for the Green’ promotion. It was her second bonus of the circuit, notching up $6,000 in total after also winning the $35,000 Ruby et Violette WEF Challenge Cup Round 8 aboard Brighton. Course designer Anthony D’Ambrosio (USA) began Thursday morning with 68 entries over his speed track in the $35,000 Illustrated Properties 1.45m Jumper Classic and 12 clear rounds. The winning time belonged to Conor Swail (IRL) aboard Ariel and Susan Grange’s Grafton in 67.28 seconds. Victoria Colvin (USA) and Take the High Road LLC’s Austria 2 finished second in 68.12 seconds. Cian O’Connor (IRL) and Ronnoco Jump Ltd.’s Crespo PKZ placed third in 69.29 seconds, and McLain Ward (USA) aboard Double H Farm’s HH Carlos Z finished fourth in a time of 69.93. Grafton, a ten-year-old Selle Francais stallion (Calvaro Z x Vondeen), is really just getting going for the 2016 season. At just ten years old, Grafton is still developing, and Swail has high hopes for the stallion this season. Swail will jump Grafton and another mount, Cita, in Saturday’s $130,000 Suncast® 1.50m Championship Jumper Classic Final. Also competing in the International Ring on Thursday, David Beisel and Harlow Investment Enterprises’ For Sunday jumped to victory in the $500 Adequan® Young Jumper Six-Year-Old Power and Speed. Kelly Farmer piloted the seven-year-old gelding Clever Conversation to another tricolor win in the Green Conformation Hunters, presented by Shapley’s Grooming Products. Farmer topped both over fences classes on Thursday morning in the E. R. Mische Grand Hunter Ring with the Warmblood gelding. “Clever,” as he is called in the barn, also topped the under saddle class, placed second in the model, and earned a first and a third over fences on Wednesday. Stephanie Danhakl’s mount First Light, who was ridden by Scott Stewart, took home the reserve title. Stewart and the seven-year-old Hanoverian stallion topped the model and one of the four over fences classes. First Light also placed third in the under saddle and earned third, seventh, and eighth over fences. Clever has had a tremendous circuit with rider Kelley Farmer of Wellington, FL. The pair has won consistently in the Green/Regular Conformation division throughout the season, including championships during weeks one, two, four, and six. “I think he’s going to be circuit champion, which is really nice,” Farmer remarked. Farmer began sparingly showing Clever last year. “We bought him down here last year in February and did a few shows, but not too much. I showed him a handful of times this summer and then started showing him more this circuit,” she explained. Farmer fell in love with Clever the first time she laid eyes on him, which was inside a horse trailer on his way to another home. It is an endearing story of happenstance that Farmer tells rather affectionately. “I had another horse coming out of quarantine, and I went to meet the truck at the farm,” Farmer explained. “Clever was standing next to my horse on the truck, so I asked the driver where he was going.” The driver explained that the horse belonged to Jennifer Bieling. At which point Farmer called Jennifer and arranged for a trial the very next day. “I told Jennifer that he’s adorable and that I’ll be there tomorrow to try him,” Farmer laughed. Farmer plans to compete with Clever in the $50,000 USHJA International Hunter Derby. The first round will take place on Saturday afternoon in the E. R. Mische Grand Hunter Ring. “I’m going to let him show this weekend in his first International Hunter Derby. It’s going to be his first real test. He was great in the International Arena during (WCHR) Hunter week, but this will be new for him,” Farmer said. The final week of competition at the 2016 Winter Equestrian Festival continues on Friday with the $10,000 Gut Einhaus Young Jumper Five-Year-Old Final, the $15,000 Adequan® Young Jumper Six-Year-Old Final, and the $20,000 Adequan® Young Jumper Seven-Year-Old Final featured in the International Ring. The Triple Crown Adult Amateur Hunter 36-49 Section A will award championship honors in the Rost Arena. For more information and full results, please visit www.pbiec.com. Lauren Fisher and Callie Seaman for Jennifer Wood Media, Inc.